Os Suecos The Haunted regressam a Portugal para um concerto exclusivo em Lisboa. A banda tem data confirmada para o RCA Club, no dia 18 Fevereiro Domingo. Na bagagem trazem o seu mais recente trabalho, Strength In Numbers. Os Revolution Within são uma banda de metal portuguesa. Formados em 2005, o grupo foi formado pelo Raça (vocalista), Matador e Faster (guitarristas), Sono (baixo) e Prata (bateria). Presentemente o line-up é constituído por Raça, Matador, Shaq (bateria), Adriano (guitarra) e Jay (baixo). O primeiro álbum da banda, Collision, foi lançado em Outubro de 2009, via Rastilho Records. Nesse ano foram considerados banda revelação pelos leitores da revista Loud! Em Setembro de 2012 é editado o segundo álbum de originais, Straight From Within, o que fez aumentar o reconhecimento da banda não apenas em território nacional mas também além-fronteiras. 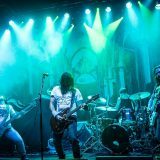 A banda já participou nos maiores eventos de metal nacionais e em alguns eventos internacionais, com destque para o Wacken Open Air. O reconhecimento que a banda obteve também lhes permitiu partilhar o palco com algumas bandas internacionais, destacando os Slayer, Megadeth, Motorhead, Kreator, Morbid Angel, Opeth, Trivium, Arch Enemy, Amon Amarth, Devin Townsend, Behemoth, Carcass, Children of Bodom, Dew-Scented, Hatesphere, Hatebreed, Skid Row, Sodom, Desaster, Gama Bomb, Angelus Apatrida, entre outros. Em suma, os Revolution Within são uma banda que tem sabido crescer a pulso e que não deixa ninguém indiferente nos palcos por onde passa, não só pela música como também pela amizade e humildade demonstrada. Revolution Within is a modern thrash metal band from Portugal. Formed on 2005, the group was founded by vocalist Raça and guitarist Matador. The current lineup of the band comprises Raça, Matador, drummer Shaq, guitarist Adriano and bassist Jay. The band’s first album, Collision, was released in 2009, through Rastilho Records. In that year the band was considered by the readers of Loud! Magazine Revelation Band. In September 2012 was released the second studio album, “Straight From Within”, further increasing recognition of the band not only in Portugal but also abroad. 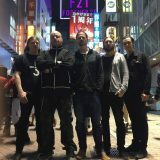 The band also participates in the major events of the national underground, and also in some international events, including Wacken Open Air. 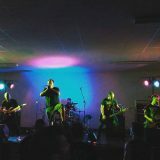 The recognition that the band obtained allowed them to share the stage with some international bands such as Slayer, Megadeth, Motorhead, Kreator, Morbid Angel, Opeth, Trivium, Arch Enemy, Amon Amarth, Devin Townsend, Behemoth, Carcass, Children of Bodom, Dew-Scented, Hatesphere, Hatebreed, Skid Row, Sodom, Desaster, Gama Bomb, Angelus Apatrida, among others. In short, Revolution Within is a band that has been able to grow the wrist and that leaves no one indifferent on stage wherever he goes, not only for the music but also for the friendship and humility demonstrated. Hatesphere, Dew-Scented, The Haunted, Machine Head, Hatebreed, Metallica, Pantera, Sepultura, Slayer, Exhorder, Suffocation, Testament, Terror, Madball, Biohazard, As I Lay Dying, Killswitch Engage, Meshuggah, Lamb of God, Vision of Disorder, and many more.